You need to install 12c R2 Grid Infrastructure (for a standalone server) software in order to use ASM and/or Oracle Restart feature. In the following I will explain how to install GI for a standalone server on Linux 6 and Linux 7. You must use at least Linux 6.4 for installation on Linux 6. 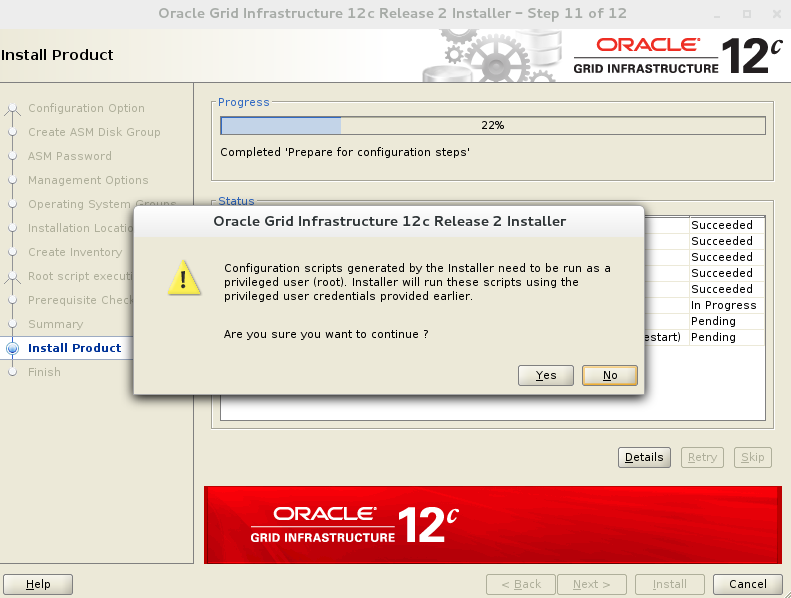 For this installation, I am using Oracle Linux 7. There are only a couple of differences between the installation procedures on Linux 6 and Linux 7 which I will mention along the way. 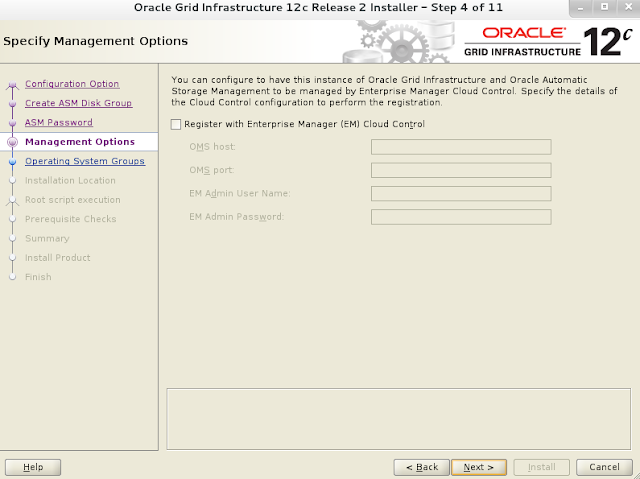 Download 12c R2 Grid Infrastructure. 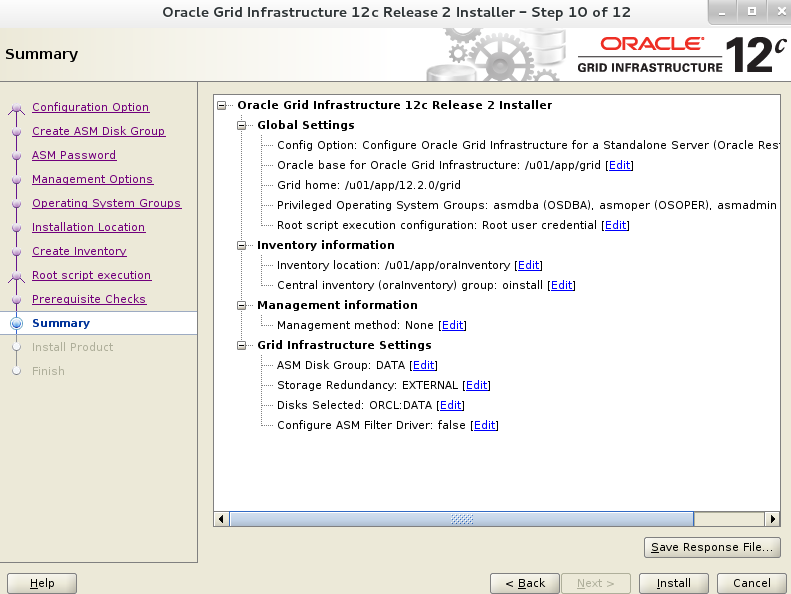 Release 2 (12.2) can be downloaded from www.oracle.com. For this installation, I have downloaded the latest release available at the time of writing this article which has downloadable zip file named as linuxx64_12201_grid_home.zip. I have copied it under /u01 directory on the server. Make sure that you have entries in the /etc/host file for the name resolution. As root user, configure Shared Memory File System. Add following line in /etc/fstab file for shared memory file system. Modify the value of “size” based on the amount of memory you will be using for the SGA (of database instance you will run on this server). An appropriate value is needed to avoid ORA-00845. We can perform automatic configuration of the server using “yum” command. 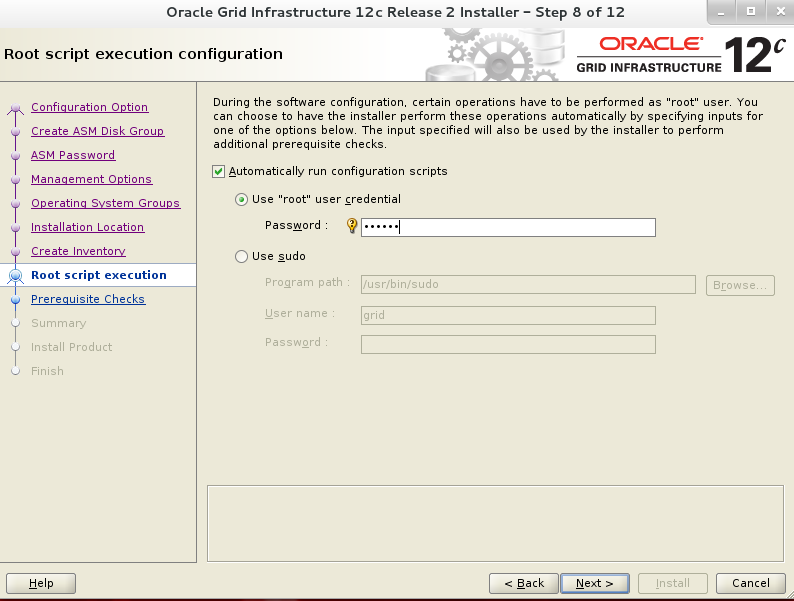 If you want to do manual configuration, skip this step and go to next step (step 7). For Oracle Linux, follow the steps mentioned in the following documents to access the online yum repository. As already mentioned, above command will install all required packages which are needed for grid infrastructure and/or RDBMS software installation. I have noticed that even if we do automatic configuration, 32 bit RPM packages still don’t get installed. Check if following 32-bit packages have been installed, and install manually if they are not. For Linux 6, install following RPMs manually if not already installed. For Linux 7, install following (or latest version) 32-bit RPMs manually if not already installed. 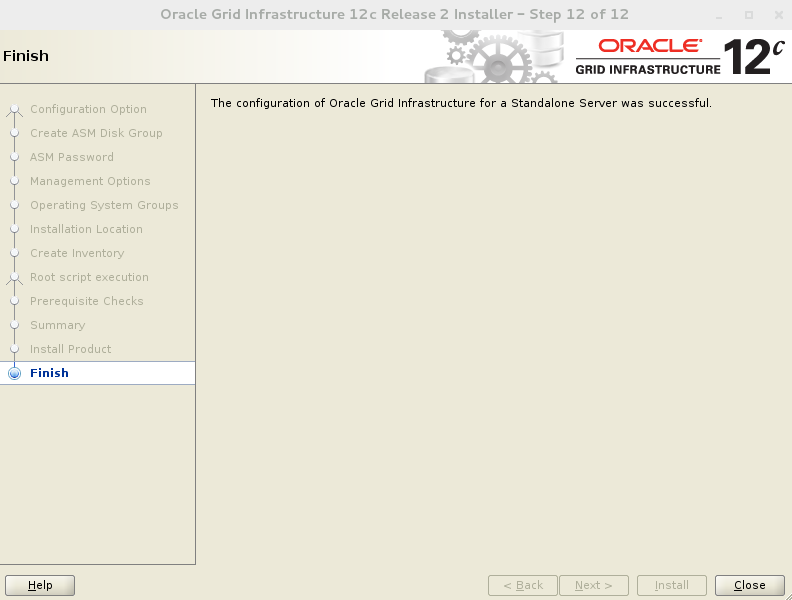 Since I will use “grid” user as GI software owner, I would need to add OS groups and also “grid” user manually. 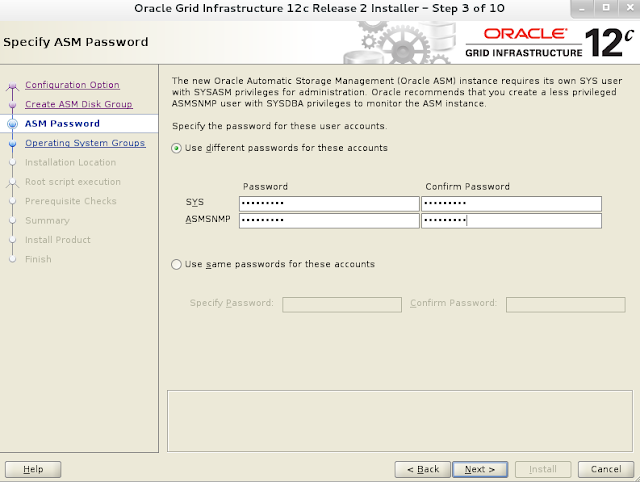 Automatic configuration done in step 6 above does not create “grid” user and ASM related OS groups. 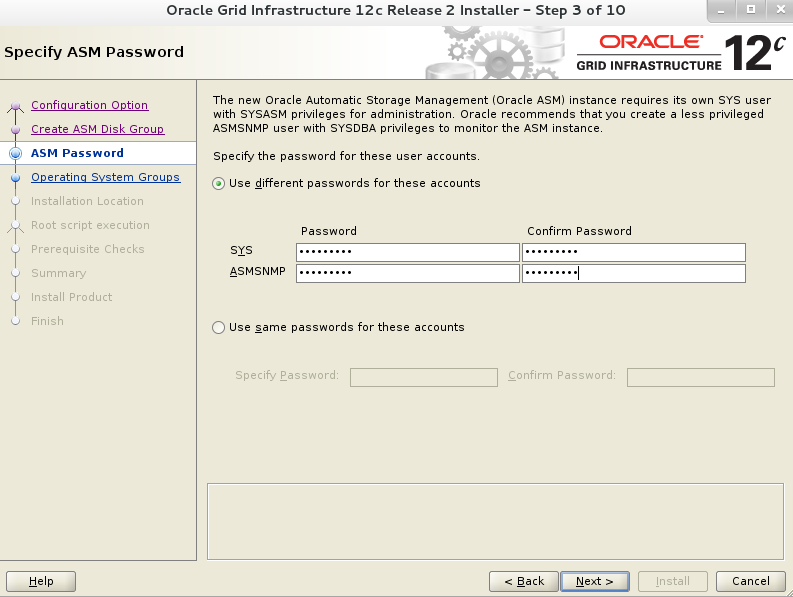 If you don’t want to use “grid” user and continue with “oracle” user, you don’t need to create “grid” user in this step, but still you would need to add “asmdba, admadmin, asmoper” groups, and make “oracle” user member of these groups. 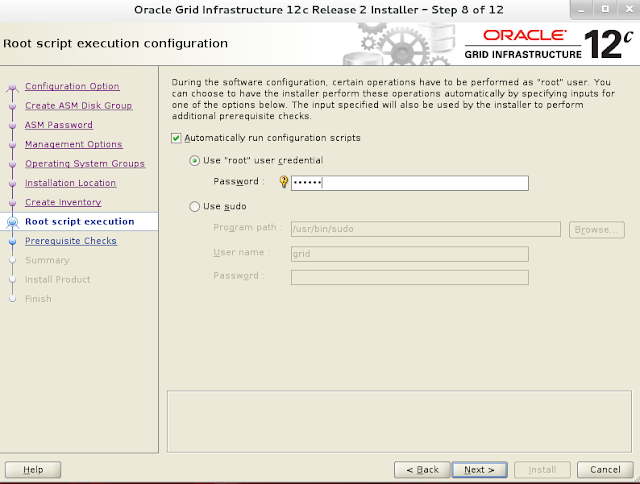 If you want to continue with “oracle” user as GI software owner, replace “grid” with “oracle” while adding following limits in the .conf file. As per Oracle’s recommendation, we need to disable Transparent Huge Pages. Disable if not already disabled. Starting 12.1.0.2 we can use ASM Filter Driver for our ASM disks labeling and configuration, and ASMLib configuration would be no longer required. If you want to use ASMLib (as I used in this installation), you can continue, otherwise you can skip details on this step and can straight away go to next step (step 12). I will explain later how to configure ASM Filter Driver. In order to use ASMLib, perform following configuration. 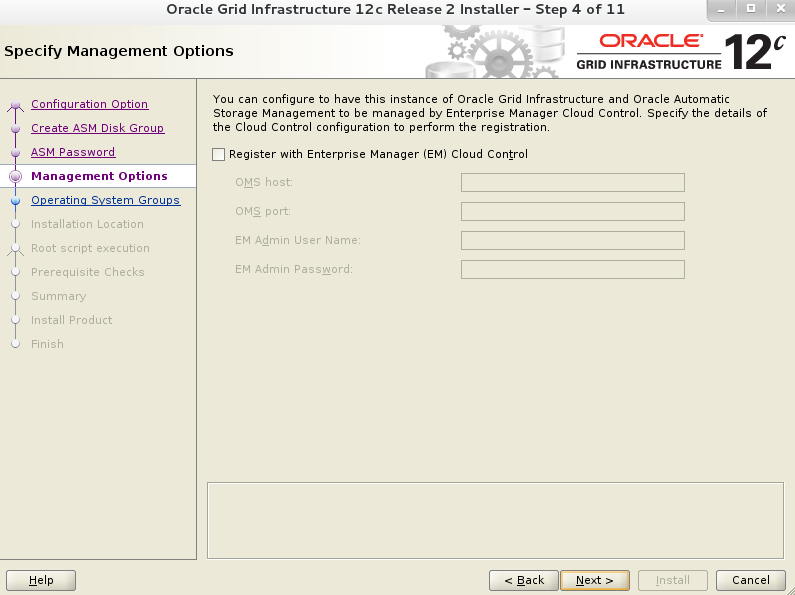 Install oracleasm-support and oracleasmlib, and then configure oracleasm. 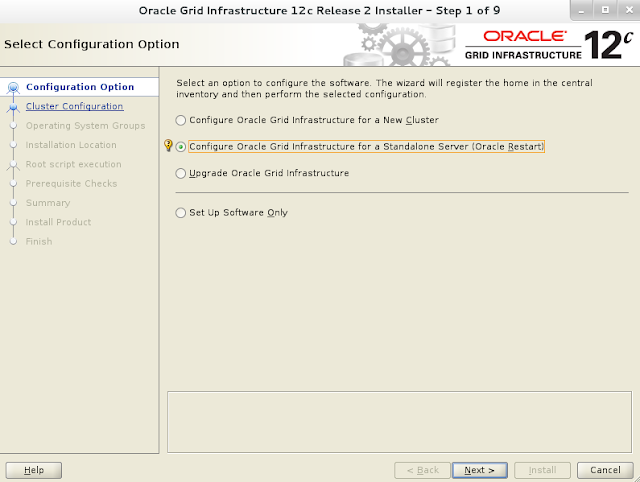 oracleasm kernel driver is built in Oracle Linux and does not need to be installed. After installing oracleasm-support and oracleasmlib packages, oracleasm driver starts working. If you are using some other flavor of Linux, for example RedHat Linux, then you would need to install all 3 packages (oracleasm driver, oracleasm-support and oracleasmlib). 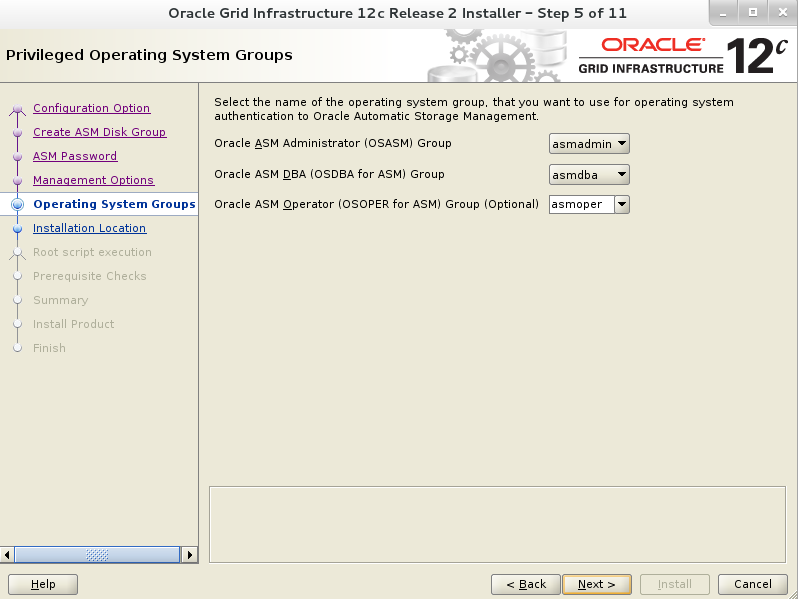 For Oracle Linux, as root, install oracleasm-support from yum repository or from Linux media, then download oracleasmlib package and install it. For Linux 6, download form the following URL. For Linux 7, download from the following URL. 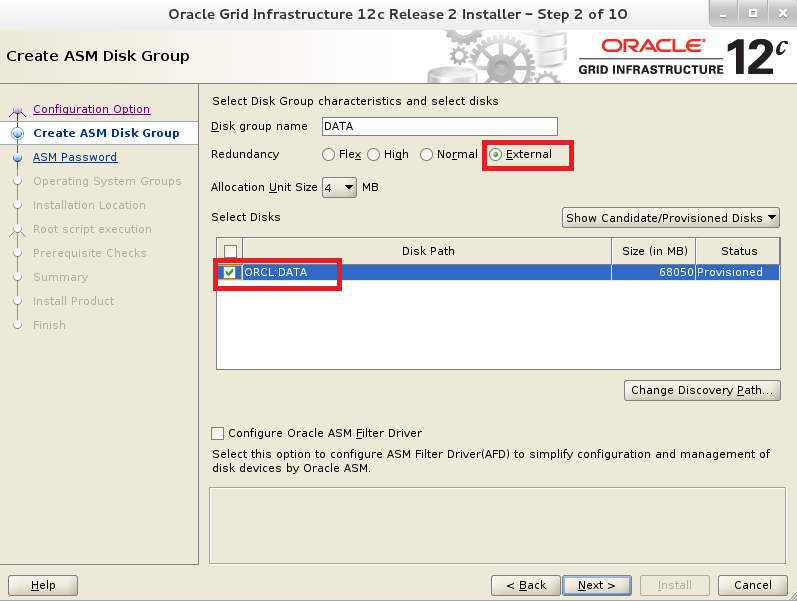 As root, partition your disks that you will be using for CRS and other diskgroups (to be used later for database) and create ASM disks using oracleASMLib. You can find out here how to create disk partitions in Linux, and this article explains how to create ASM disks using ASILib. For this installation I have created 1 ASM disk with name "DATA" to create a diskgroup "DATA" that will store OCR. Oracle recommends to using “Deadline IO scheduler” for optimum performance of ASM disks. Following command will tell if Deadline IO scheduler is already configured or not. Here /sdb/ is the disk I used to create ASM disk in the previous step. You may check for all of your disks that you will be using. For me, Deadline scheduler is already configured. If not, following is the procedure to configuring Deadline scheduler. Add the following in /home/<username>/.bash_profile file of grid user. At this point, we do no need to set other environment variables i.e. ORACLE_BASE or ORACLE_HOME. 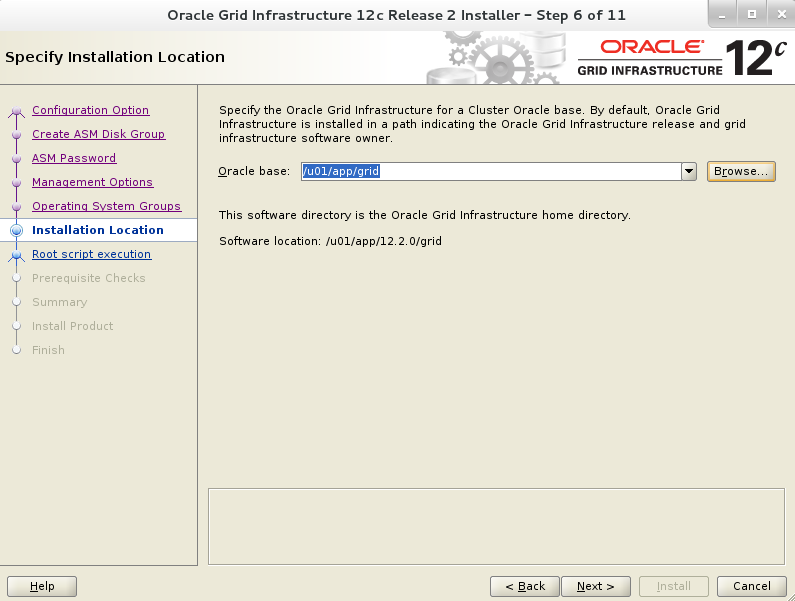 Now we will creating oracle base and oracle home directories for grid infrastructure installation. 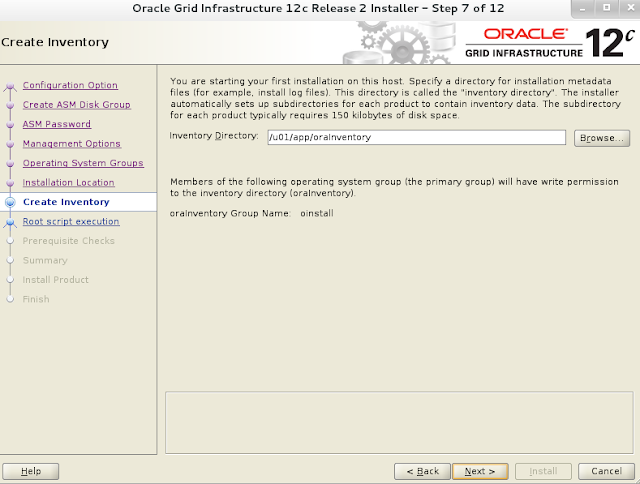 As root, create directories and change ownership to grid user. 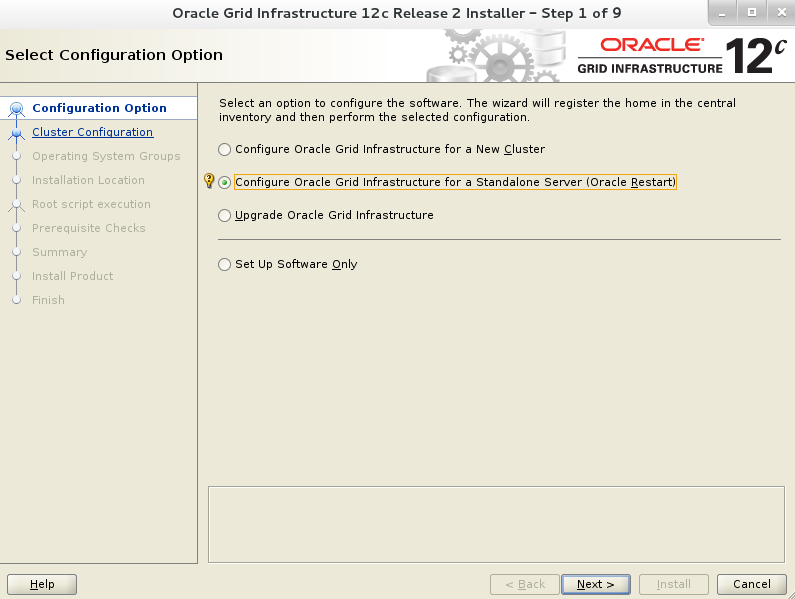 Oracle recommends creating separate ORACLE_BASE for GI and RDBMS installations. Thus, we need to create a separate ORACLE_BASE for RDBMS installation that will be owned by user “oracle”, and we can do it right now, or during RDBMS installation. Now we need to extract the downloaded zip file for GI installation. Starting 12.2, we have image based installation for Grid Infrastructure. 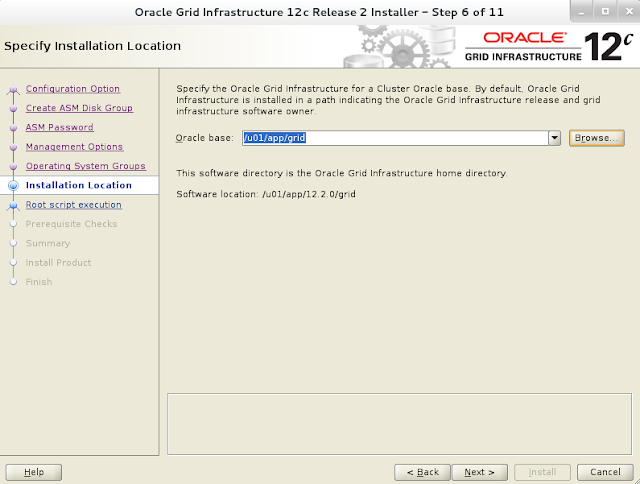 It means that we need to extract the zip file under ORACLE_HOME for GI, and software is installation is completed. After extracting the zip file (installation), still we need to run the setup to perform all configurations and other required tasks. After logging in as grid user, extract the zip file under GI home directory that we already have created. Installation wizard will create an ASM diskgroup by using ASM disk we have already created, as I mentioned above. 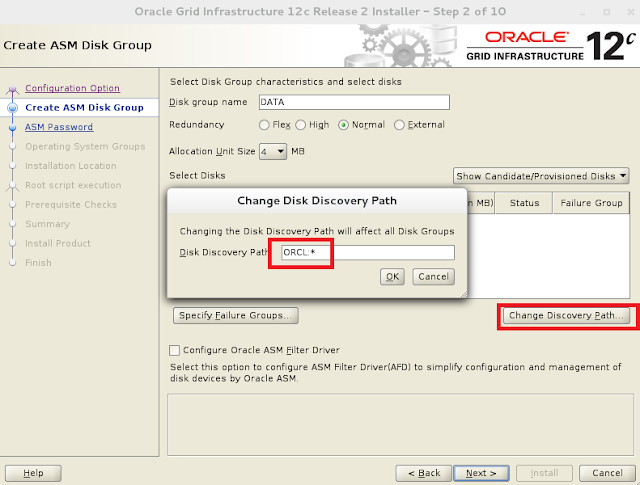 If disk(s) is/are not listed here, click on “Change Discovery Path” to specify the correct discovery path. For example, I also saw here no disk listed and after clicking on “Disk Recovery Path”, I found out that discovery path was set to “/dev/sd*”, whereas the ASM disk that I created using ASMLib needs to be discovered using discovery path “ORCL:*”. 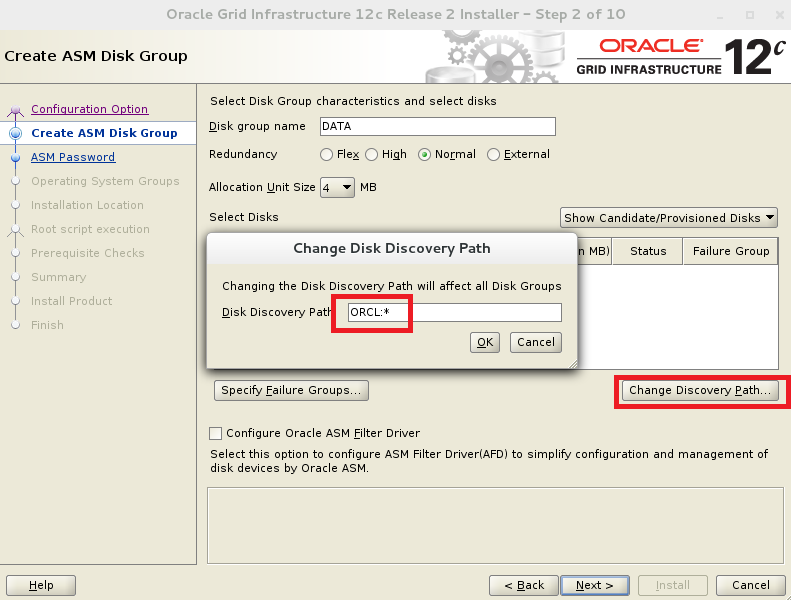 So after I changed the discovery path to “ORCL:*”, wizard was able to discover the disk. This screen also allows you to configure ASM disks using ASM Filter Driver (ASMAFD). If you skipped step 11 above and have not configured ASMLib, follow steps explained here to label disk for ASMFD before GI installation. Since I have a single disk, I am selecting “Normal” redundancy for my diskgroup, and selecting the disk by clicking checkbox. Click Next. We have option to execute configuration script manually after the installation, or if we provide the root credentials (or sudo credentials), scripts can be execute automatically by the installer. Here I chose to execute scripts automatically by providing root password. Click Next. Solve, if prerequisites check shows any warning. For me, it is showing low RAM which I can ignore because I am using a virtual machine and I do not have sufficient RAM available on my host OS. Second warning is because cluvfy is not installed and I can also ignore this warning. Click Next. Click on Install from Summary screen. Click Close after configuration completes. Check the status of GI services. You can add following environment variables in .bash_profile file. Installation has completed. 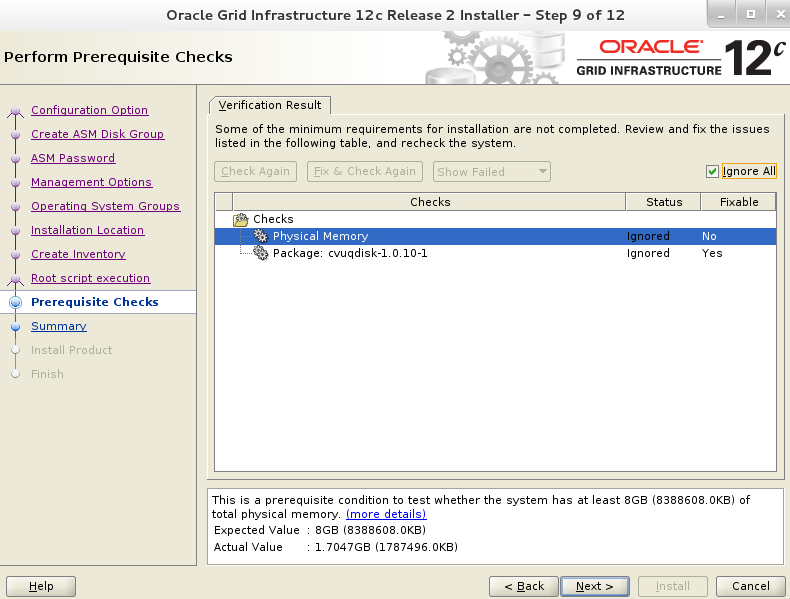 You may continue with Oracle 12c R2 Database software installation.